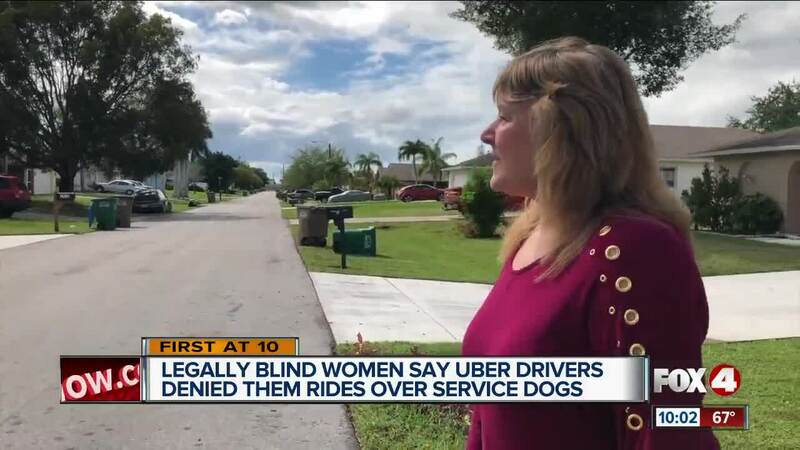 LEE COUNTY, Fla. — Two legally blind women said they've been denied an Uber ride several times because of their service dog — which is against the law and company policy. Mary Pierce from Fort Myers goes to the gym three times a week and sometimes takes an Uber to get home. Pierce, who is legally blind, goes everywhere with her service dog, C.W. However, she said some Uber drivers see her service dog and refuse to pick her up. She said she’s been refused at least 3 times this month. “It makes me feel very violated,” Pierce said. Her friend, Mary Ann Grignon is also legally blind and experienced the same thing in Cape Coral. She said one time an Uber driver pulled up in front of her house but refused to let her service dog, Percy in the car. They both said they hear all kinds of excuses from Uber drivers. However, at the end of the day, it’s a violation of the Americans with Disabilities Act. .
On Uber’s website, , it states that drivers have a legal obligation to transport riders with service animals and there are no exceptions. Paul Robb, an Uber driver, said he always obeys the service dog policy. “It’s disappointing because Uber’s policy is to accept service animals and I’m a dog lover so any dog can ride in my car,” Robb said. Pierce said when it happens, she reports it. “Normally I get a $25 credit and the Uber driver is no longer driving for Uber," Pierce said. Uber said every driver signs an agreement to accommodate riders with service animals and is given information on transporting people with disabilities. Drivers who break this rule are removed from the app permanently, Uber said in a statement. However, both women said more needs to be done to educate and train drivers on service animals. “I just want to get where I am going as the same as anyone else,” Grignon said.